Be the first to share your favorite memory, photo or story of Geraldine. This memorial page is dedicated for family, friends and future generations to celebrate the life of their loved one. 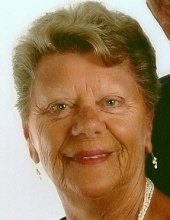 Geraldine Arlene Maleske, 81, loving wife, mother, grandmother, and friend passed away on December 31, 2018 in Lansing, MI. She was born July 13, 1937 in Wayne County, MI, daughter of the late Arthur and Elsie (Doletzke) Hartwig. Geraldine was retired from Blue Cross Blue Shield. She enjoyed her retirement years in Sun Lakes, AZ and Conway, SC. She was an avid golfer with two holes in one; loved to travel, take cruises; enjoyed sewing, watching football, was an excellent bowler; and a member of the Audubon Society. She is survived by her daughters, Kristine (Joe) Boulos and Keli (Scott) Algren; granddaughters Hanna Root and Cindy Hall, great grandson Brooks Hall; also other grandchildren and great grandchildren. She is preceded in death by her loving husband of 50 years, Jim, with whom she shared a wonderful lifetime together. Also preceding her in death is her brother, Ray Hartwig and sister Shirley Bentling. To send flowers or a remembrance gift to the family of Geraldine A. Maleske, please visit our Tribute Store. "Email Address" would like to share the life celebration of Geraldine A. Maleske. Click on the "link" to go to share a favorite memory or leave a condolence message for the family.